With The Academy Awards, more commonly referred to as “The Oscars”, coming up this Sunday, We would like to give insight to one of the more obscure pieces of Blachford’s history, our 1982 Academy Award. At the 54th Academy Awards, hosted by Johnny Carson, H.L. 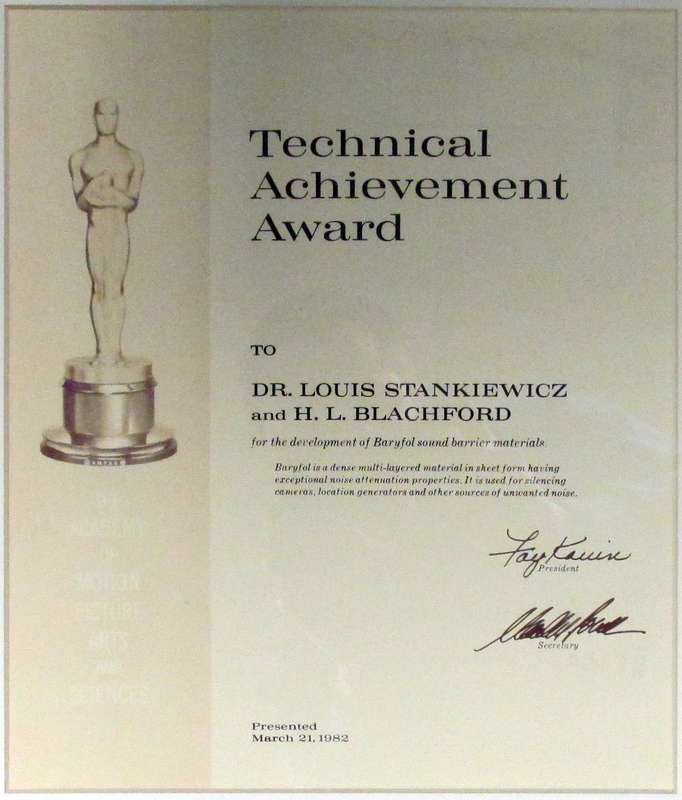 Blachford was presented with the 1982 Technical Achievement Award by The Academy of Motion Picture Arts and Sciences for the development of the Baryfol (now Barymat) sound barrier. At one point, John was able to sell Aquaplas to Panavision and it was applied to the camera that filmed the production Mutiny on the Bounty, starring Marlon Brando. After the success of the film, Aquaplas was then used by all 20th Century Fox productions. In the mid 1960’s, John paired the use of Aquaplas DL-10 with a new product, Baryfol M-1BT/ST, and the “Hollywood Special” BV-24C. This combination was used to cover the floor of a diesel powered generator, reducing the noise to a level of 50 dB at 50ft away, something unheard of at the time, no pun intended. A few short years later, John left California Sound and joined the team at H.L. Blachford in 1972. It was after a couple years of success that John put up Baryfol for an Academy Award along with Dr. Gary Marlotte from Blachford. This attempt was initially denied by the Academy but that did not falter John’s efforts. A few years later, several of the top Sound Directors in Hollywood suggested that Baryfol deserved an Academy Award. John reopened his pursuit of an Oscar, ultimately earning the 1982 Technical Achievement Award for the development of Baryfol sound barrier materials for H.L. Blachford and Dr. Louis Stankiewicz. The award stands as one of the only acoustical award given out by the Academy of Motion Picture and Sciences to date and is a great representation of our company’s persistence and commitment to excellence. See Blachford’s Official Academy Award Certificate here!